After Christmas, we headed to HomeGoods to troll around and check out the Christmas clearance and there was this gorgeous black and gold piece of furniture. I mean…it was made for my house. It’s the Proximity Deck & Hutch by Magnolia Home (yup, that Magnolia Home) and it was priced at $499.99. I did a quick google search and found it retails for $800+, so out the AMEX came and we bought it. 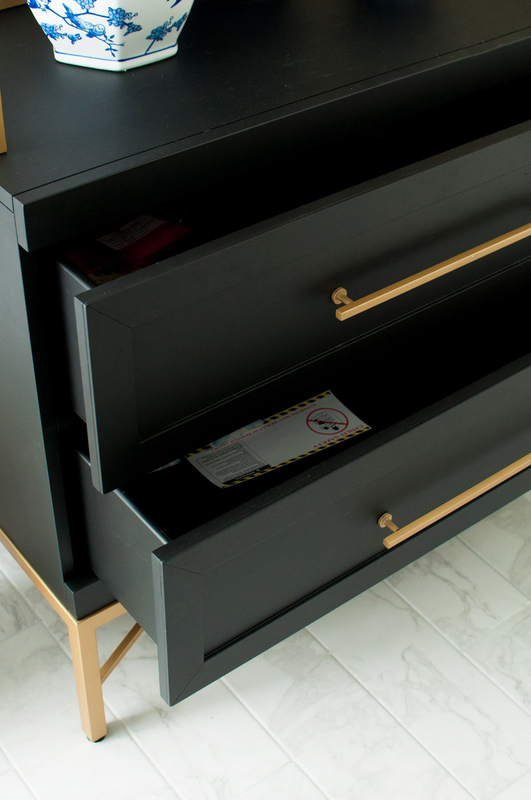 It lived in my house a few days before I got around to styling it, and truth be told, the drawers are still empty. I’ve tried to reign in the clutter around here, so I’m happy to not have to use every inch of storage that’s available. 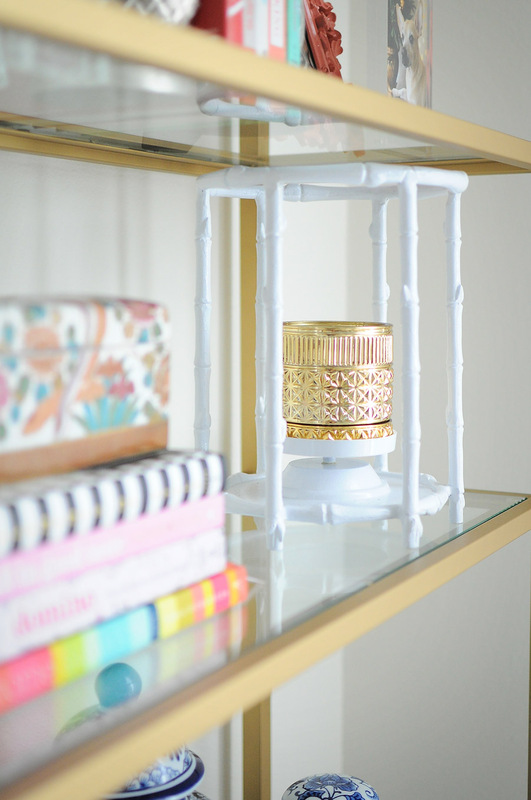 The glass shelves are so airy and I styled this in under 15 minutes including numerous walks to the back of the room to check out how it looks. 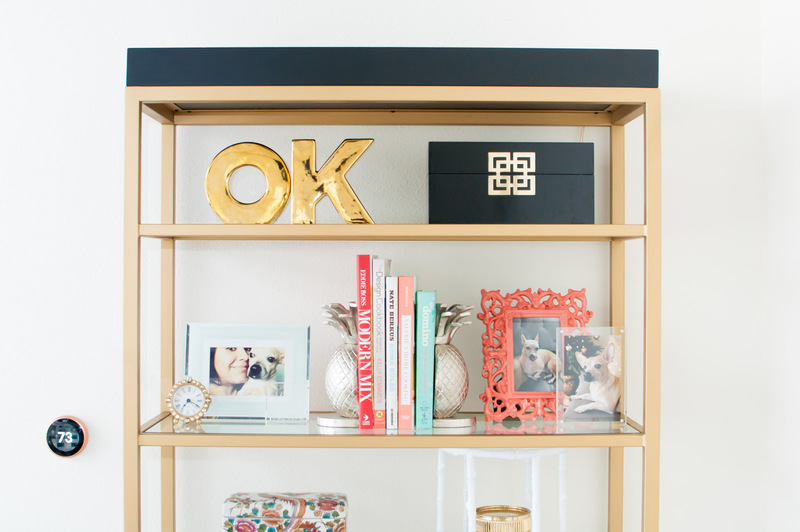 So, here are my five tips for styling a bookcase that looks chic, curated, and simply fabulous! Similar items in a cluster always looks good, so this is the time to show of your collection of whatever you got. I chose ginger jars/blue and white items for my collection. Other ideas could be plates on stands, vases of similar colors/styles, candles…really you can’t go wrong with a cohesive collection. I know I constantly read to have stuff in odd numbers, but sometimes decorating rules can be broken. Books always look good on bookshelves…obviously. Kind of the point. I don’t have a ton of books, but I do try to incorporate two stacks/groupings of books. One of the stacks is literally a stack and the other books are standing up between pineapple bookends. 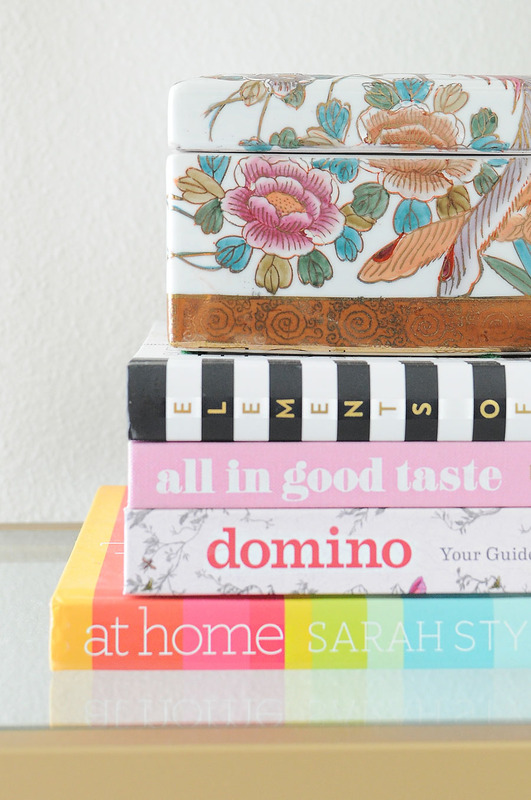 Books showcase your interests or travels, become a pedestal to hold smaller decor items, and they add color/pattern. Books can get pricey, so I suggest heading to your nearest thrift store to find cool books with unique spines for decor, or see if your local library is having a book sale anytime soon. Often times you can score books for 25-cents! 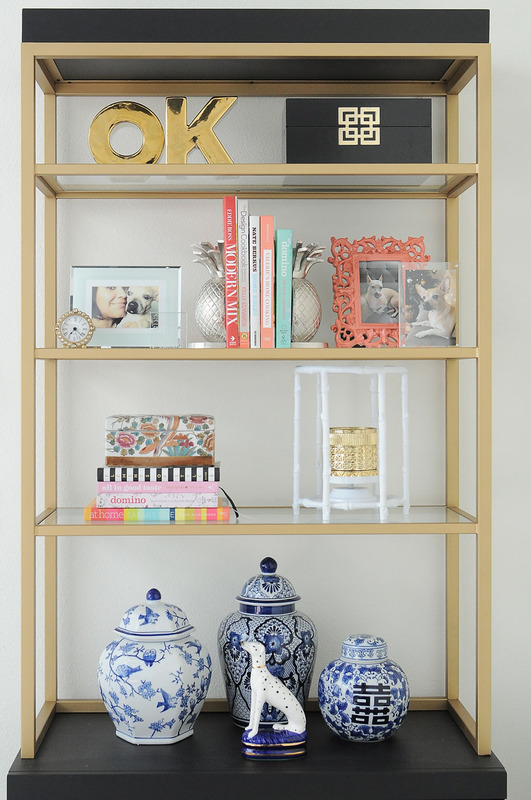 Your bookshelf is a great place to incorporate family photos or art. I included a cute photo of Pee Wee, plus another one of just him in a sultry pose on the sofa. I’m not a big fan of framed family photos on the wall, that will likely change once I have a kid, but I am a HUGE fan of gorgeous frames with family photos on shelves. If you’re not a big photo person, art is always good. I did that on these black backed bookcases from our former home. 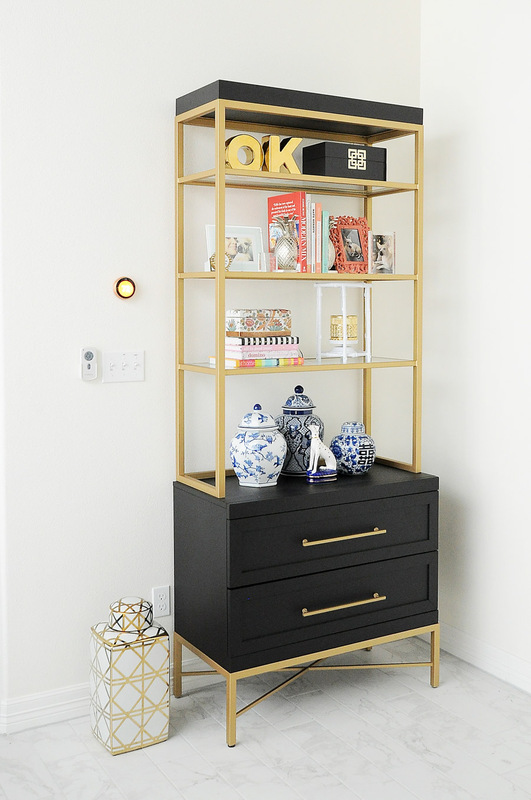 Leaning art with a simple mat and gold frame is always chic. You can find tons of free printables online (like these audubon ones I used in my $100 dining room makeover). This tip is a little bit harder to master, but I’ll explain it as simply as I can. 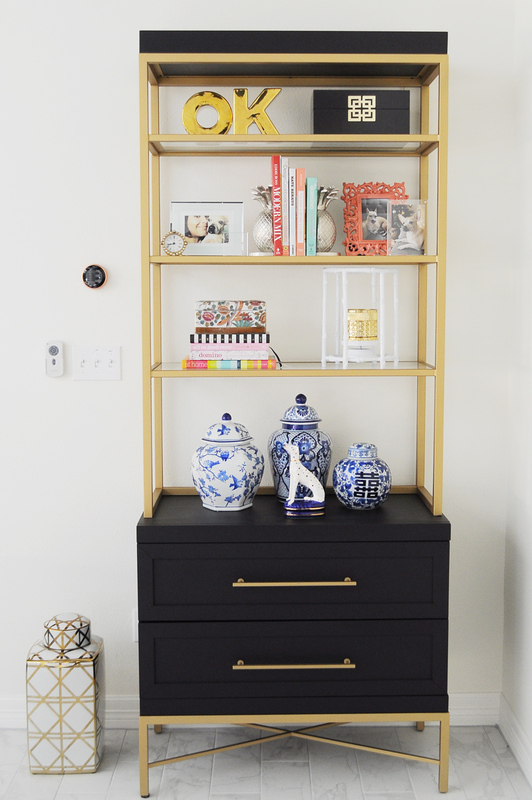 You want to make sure the elements of your shelves balance one another. If something on the top left is visually heavy, make sure the item directly under it (bottom left) isn’t. AND then also make sure that something of the same visual heft balances it (bottom right). I did that with the top and third shelves- they compliment each other and are somewhat symmetrical. In-between, I have an odd number of smaller vignettes. Think of it as an X if you have two shelves. Or a zig-zag if you have multiple shelves. 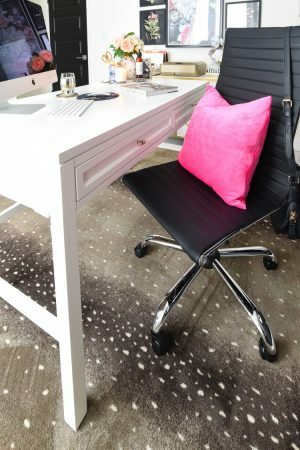 You don’t want your styling to feel too much to the left or the right…you want it balanced. As you style, take a few steps back and examine it from various points of the room. If something looks off, move it around. Styling shelves is all about refined editing and proper balance/scale. 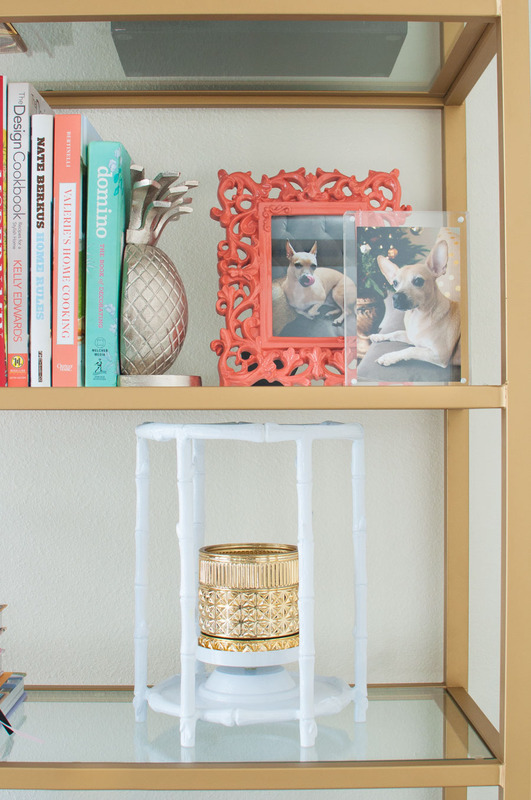 Metallics add drama, reflections, and sparkle, so they’ll instantly make your shelves look chic and put together. 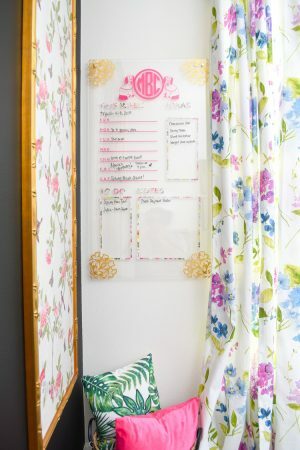 And a bonus tip…incorporate something quirky! I found this Fitz & Floyd dalmatian bookend all by his lonesome at a local thrift store for $7. I hope to one day find his twin (and are they really worth $400?! 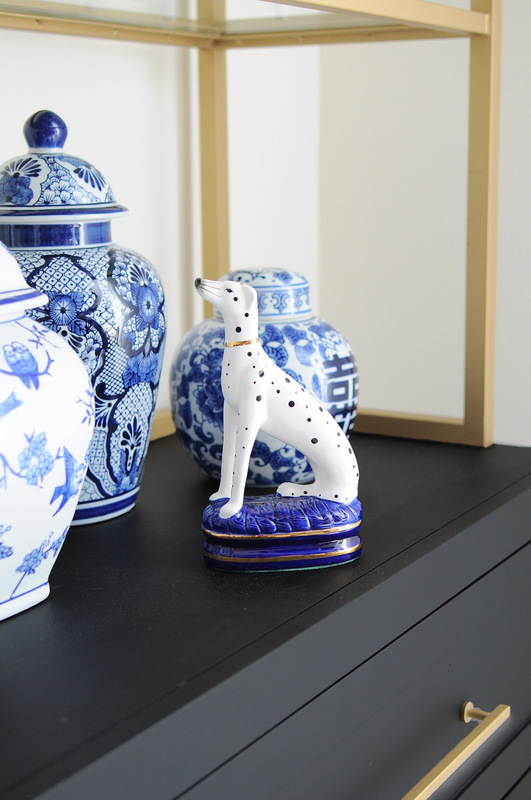 ), but I knew he’d look dapper with my blue and white collection, plus it’s a nod to the fact I love dogs. And black and white. And blue. But truly the biggest tip of all is once it looks good TO YOU, stop and enjoy! It’s easy to get caught up in what others do, but as long as you love it, what else matters? Decorate fearlessly! 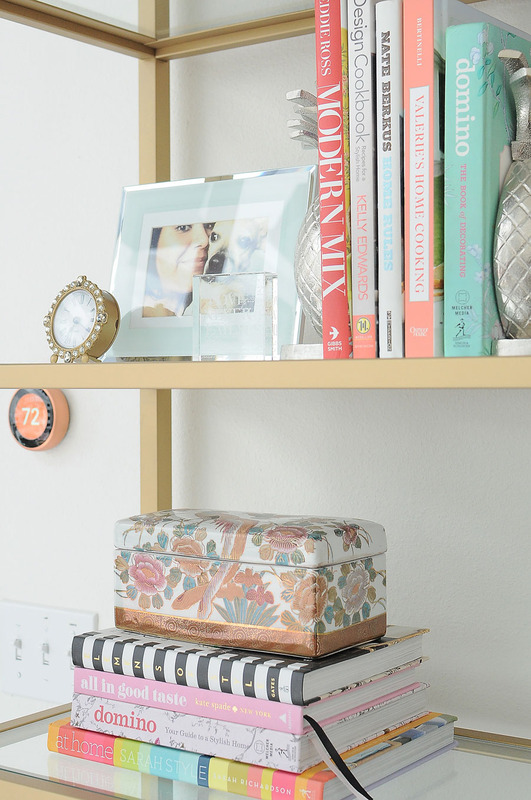 These tips should hopefully inspire you to go re-decorate a bookcase, a nightstand or your open shelving in your kitchen. 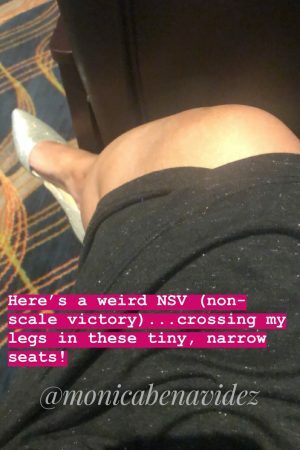 And while it’s fun to shop (I am linking products sources at the bottom of the post), make sure you dig through what you have in closets. I am always amazed at what I find in them once I look. 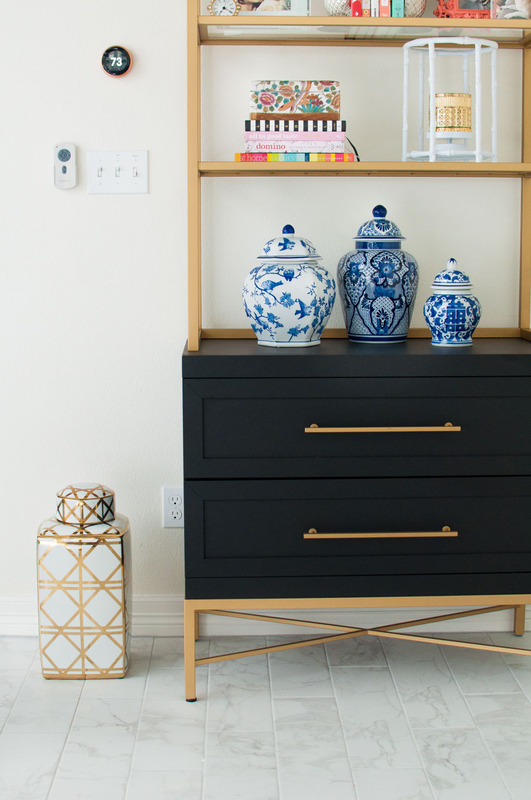 I spent so much time in January on the dining room and office makeovers that I haven’t really been able to fill you all in on the sofa and rug I ultimately chose for the living room, so I’ll be talking about that a bit later this week. 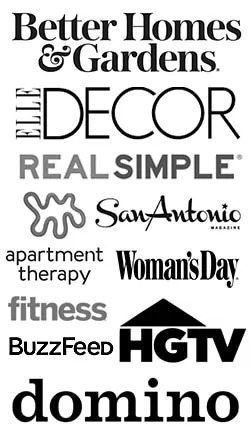 Affiliate links used below- thanks for supporting my blog! This is totally crazy. I have the Fitz & Floyd dalmatian but mine is laying down with his paws crossed and mine is two pieces and could hold small trinkets. It was my mothers and I found it when I was unpacking her stuff, I had no idea it was valuable.